An internal battle is being fought inside the Trump administration to save Iran's access to international financial markets, providing Tehran with a critical lifeline ahead of the implementation of harsh new economic sanctions, according to multiple U.S. officials who spoke to the Washington Free Beacon. Top officials in the Trump administration's Treasury Department—including some who hope to save the landmark nuclear agreement—are said to be pushing for Iran to remain connected to the SWIFT banking system, an international system that facilitates cross-border transactions. SWIFT leaders were in Washington, D.C., last week holding meetings with Trump administration officials to ensure that Iran retains its access to the international banking system, which has helped keep the ailing Iranian economy afloat as European allies seek to continue doing business with the Islamic Republic, according to U.S. officials familiar with the situation. While President Trump and top White House national security officials such as John Bolton have made clear that SWIFT and European allies must end their business dealings with Iran, a cadre of Treasury Department officials are said to be standing firm against this effort, paving the way for an internal showdown ahead of the Nov. 4 deadline for new sanctions, sources said. "President Trump instructed the administration to restore all of the sanctions from the Obama era and then some, because that's what maximum pressure means," said one U.S. official who works extensively on Iran policy. "During the Obama era, SWIFT disconnected Iran due to sanctions threats," said the source, who was not authorized to speak on record about the sensitive situation. "There are people inside the administration who think they can convince the president to be weaker on Iran than Obama was. That's a bold strategy. Let's see if it pays off for them." Some details of this internal battle were first reported by the Washington Post ahead of the European visit. 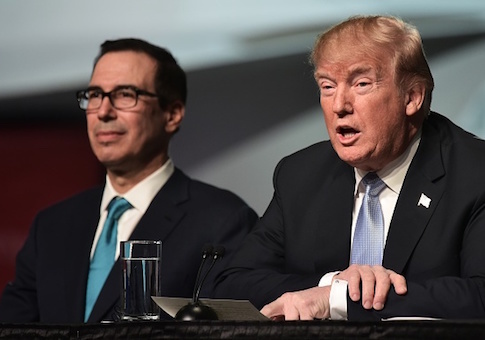 The Post identified Treasury Secretary Steve Mnuchin as the Treasury official leading the battle to save Iran. Congressional leaders are said to be aware of this effort to save Iran's access to SWIFT and are pushing back with force. "Ultimately, SWIFT and the Europeans must choose between doing business with the United States or Iran," a Cotton spokesman told the Free Beacon. "Those attempting to use a creative backchannel to facilitate commerce with Iran would do well to remember that the $19 trillion U.S. economy dwarfs Iran's, which is approximately the size of Maryland's." Cruz and other allies in the Senate have repeatedly warned European allies and SWIFT leaders—which includes U.S.-based banks JPMorgan and Citibank—that Congress will not hesitate to sanction any institution or government that breaches the new U.S. sanctions. A showdown on SWIFT is now likely, particularly as Iran pursues a greater number of economic partnerships across the globe. "In July, Senator Cruz and nine fellow senators sent a letter to European ambassadors emphasizing that sanctions like the ones regarding SWIFT are the result of congressional statutes, and Congress expects our allies will comply with them," a Cruz spokesman told the Free Beacon. "In August, he and 15 fellow senators sent a letter to the Treasury Department emphasizing the importance of enforcing SWIFT-related restrictions, because otherwise the President's maximum pressure campaign will fail and the Ayatollahs will be able to continue their terrorist and nuclear activities," the spokesman said. "Everything that's happened since then has confirmed those positions." The Treasury Department did not respond to Free Beacon requests for comment on the matter. One former sanctions official who worked extensively on the Iranian portfolio told the Free Beacon that while some may be angling to save Iran's access to SWIFT, it remains mostly in the president's hands. "It's basically up to the president at this point," said the former official, who would only speak on background. "There's a big push by SWIFT to get opinion leaders to side with Iran and Europe, but Trump knows how weak he will look if he doesn't get them to disconnect. He can't have a policy weaker than Barack Obama's for crying out loud." This entry was posted in National Security and tagged Donald Trump, Iran, Steven Mnuchin. Bookmark the permalink.